I finally finished my Doctor Who scarf! If you've never knit one, let me tell you, it's a LOT of garter stitch. I know, I know. Of course it's garter stitch. Everyone knows that! But look, you know how you KNOW a building is high, but the true knowledge of how high it is doesn't hit you until you're at the top? 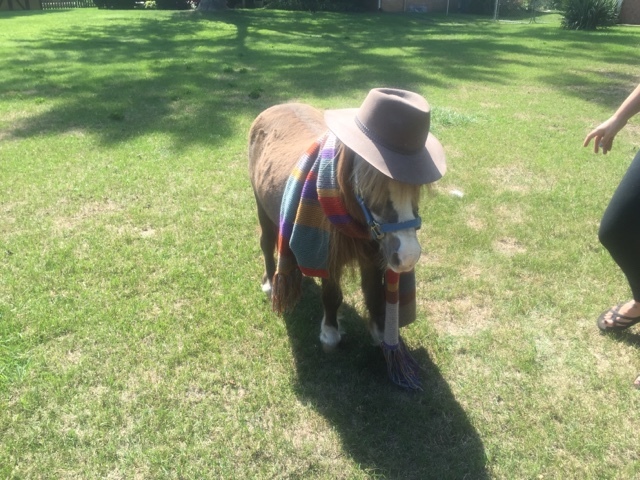 That's the Doctor Who scarf. You know it's a long garter stitch project. But you don't really know until you've made one! I started it on the first day of Gen Con, with the goal of finishing in 30 days. It was more like 50, but not bad for all this garter! 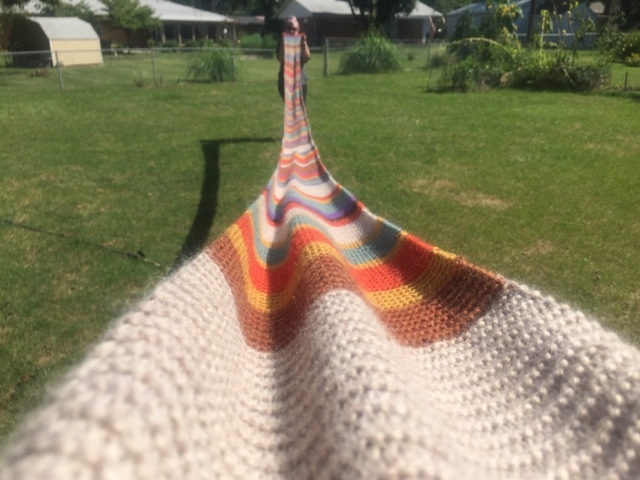 For the color changes, instead of doing an invisible weave after I was finished, I wove the loose ends into my work as I started the first row of each color change. Made it much easier and meant that I didn't have a lot of finishing work. I am the worst at weaving in ends, seaming, all that jazz. I hate doing it and I procrastinate as much as possible. Weaving in these color change ends as I knit meant that I didn't have a lot to fuss with once the scarf was done! I haven't blocked it. I don't even know HOW to block something this long! 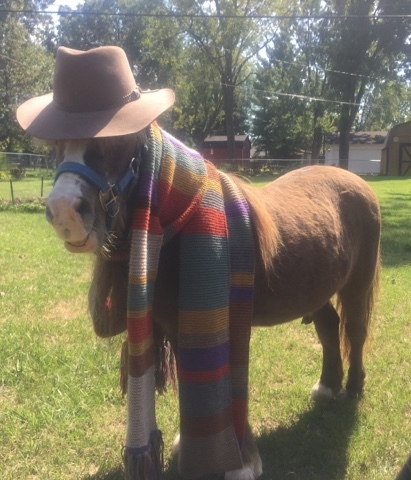 For a model, I talked my mini horse Starkey into cosplaying as Doctor Whooves. 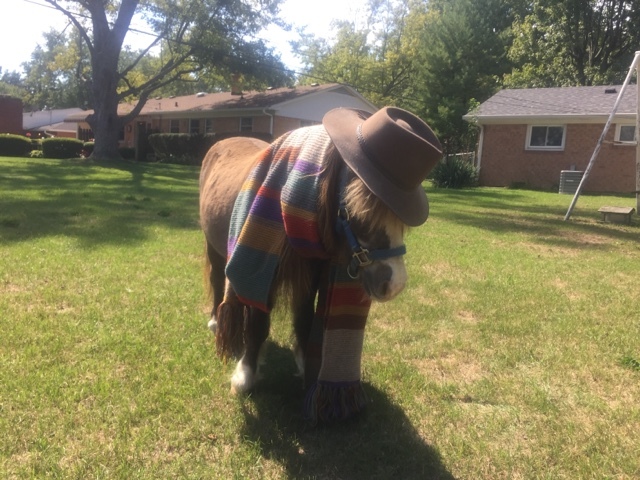 He agreed, on the condition that he get a lot of peppermint treats. I'm seriously thinking of doing this to him again for Halloween. Or I might start cosplaying him as other sci-fi characters. I think he'd make a cute Jedi! Now it's back to "work" knitting. I have several patterns on the needles and a new book project I've been steadily working on! Not to mention making sure I knit something fantastic to wear to the VK kickoff party in Minnesota in a couple months! ** bonus pics of Starkey! 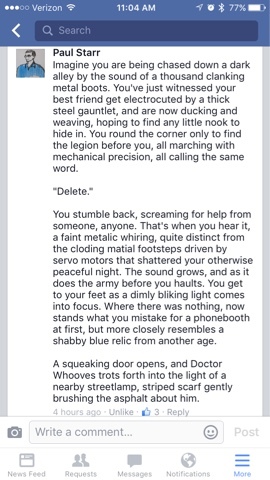 Edit: my friend Paul wrote this on Facebook. It made me smile so much I had to share! Meh. It's a scarf. You don't need to block it! It's pretty fabulous, but I'm pretty sure Starkey wears it best!